Ah, the second kid, everyone warns you, “there’s nothing like your first”. And to a large degree, that is so right. If you are reading this and you are pregnant with your first baby, please please, take the time to savor it, the good and the bad, let people help you, obsess over nesting and decorating, go wild, because if you have a toddler when you get pregnant again, you won’t have a spare second that you aren’t exhausted to even reflect on being pregnant.... and that’s not entirely a bad thing. 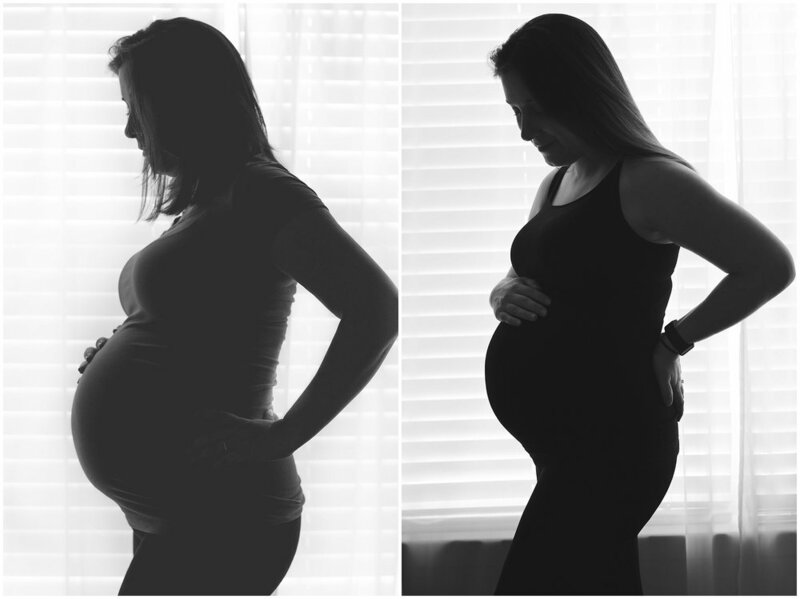 Even still, I’ve gotten lots of questions all answered FAQ style below with some of my favorite maternity photos! This time, on a whim, completely out of character for me I decided to keep it a surprise!! I decided before we even started trying to get pregnant and Ed was not in agreement but was willing to do it if that’s what I wanted! There have been downsides like having to say “it”, not being able to tell Avery ‘brother’ or ‘sister’, not being able to buy gender specific clothes, etc. But overall the anxiousness is really fun considering you don’t have the same level of anticipation with your second pregnancy. I am really looking forward to Ed telling me if we have a daughter or son in the delivery room, so I’ve been holding on to that thought to get me through. Do you have any motherly instincts about what you’re having? Yes, but I also thought I knew when I’d go into labor and that date has come and gone too. Honestly, I love the wives tales, I love hearing if people use ‘he’ or ‘she’ on accident, I think everything is some sort of sign. I also am an engineer who strives for balance so I often think about one of each in this way, but we will see!! Have you had the same pregnancy symptoms? No, but maybe? Honestly, you have so much more time during your first pregnancy to obsess over (and google) every little symptom. I very gladly did not have as bad of morning sickness and I didn’t develop as many aversions during my first trimester. I am extremely grateful I didn’t develop my aversion to coffee that I had with Avery until ~ 20 weeks because no coffee + toddler could have lead to the world collapsing. Overall the other symptoms have been similar and either happened earlier or were more pronounced. My biggest ailments being round ligament pain, heartburn and lower back pain. What have your cravings been? Now this is a weird one. With Avery I craved fruit smoothies and ice water, but heck, it was August. This time my cravings have been of nostalgic criteria... I craved all kinds of junk food from my childhood that I haven’t had in years... magic shell, s’mores pop tarts, and spaghettios! I also ate Ben and Jerry’s 5 out of 7 nights a week. Does Avery understand what is going on? I think she understands aspects of it for sure. We talk a lot about the baby, she loves to hug and kiss my belly and we ask her for name suggestions which her top 3 are: Pancake, Birthday and Berries. She recognizes some of her old toys that she is too old for and will put them in the baby’s room and is excited to bring the baby to our house. We have also told her that mommy is going to go sleep at the doctors and she’s very concerned I will get a lot of shots. Will you have any more? We feel like our family will be complete as a team of four but I suppose you never know! While my pregnancies have been relatively straightforward and low-risk (which I’m grateful for), I’m still not someone who ‘loves being pregnant’. Did you still work out? As I mentioned before, everything is just more sore or uncomfortable. I also struggled a lot more with my emotions and anxiety than I remember with my first pregnancy. I think a lot of that had to do with mom guilt and being too tired to play with Avery and feeling like my days were few that it would be just the 3 of us. But Ed has been a great help in taking up a lot of the chores and honey-do items so that we would have completely free weekends to enjoy as a family which has been really special. When will you stop working? When this baby comes! I’d like to save my vacation to spend on seeing family next year so I have been working mostly full weeks and plan to until the baby decides to arrive :) I have the extreme fortune of being able to work from home as needed and since the baby is so low, sitting in desk chairs can be really uncomfortable so I have been working a lot form home with my feet up as needed! How long will you get off for maternity leave? My company just released a new maternity leave policy in January and we now get 12 weeks off after delivery! At full pay! Hooray! I took 11 weeks with Avery and no time will ever be enough but I plan to enjoy the holidays to the fullest ! I plan to listen to my baby. I obsessed over schedules and routines with Avery and while she is definitely a child that strives on routines, I didn’t need to be doing that so early. I definitely learned that trying to get her on a routine by the time she went to daycare wasn’t a big deal because she found her routine a few weeks into daycare and that age is more normal for that. So this time I really plan to learn the baby’s cues, listen to the baby and enjoy the time together. We decided to keep the nursery as a nursery and give Avery the new, bigger, big girl room. So not too much has changed in the nursery. We initially had Avery in a ‘big girl bed’ in her new room but found it was a little too early for that much transition and so we now have a crib in each room. I’ve got a few more things to hang on the wall but for the most part, everything is ready and waiting! Huge thank you to our friends at Rainsford Photography for these special memories! And to Cindy McGrath Makeup for making me so pretty at 6am! My Secret to Meal Planning and a GIVEAWAY! Another motherhood blog? This one features cute baby pics, (ok toddler), products that got us through the first year, tips for balancing work and life, general life hacks, and tips for improving photography of your own! It can be hard to keep everything going and pinterest and instagram make it look like everyone is meal prepping on a Sunday, eating perfectly all week and here you are asking your husband for the millionth time 'what do you want to eat this week' staring at that blank post it note meal planner you bought at target. Then if you DO get it together you write down the meals, go through recipes, make an ingredient list, check the pantry for what you have (I forget this step a lot and end up with a lot of paprika).... you look up and its dinner time on Sunday and you haven't even made it to the grocery store. Well fear no more, I'm sharing our family secret to easy meal planning, recipe storage, and grocery shopping and it's called AnyList. AnyList is an iphone (and desktop) app that we have been using for over 4 years and it started as an easy way to create and share shopping lists between our phones, so I could make a list and it would ping Ed's phone and while he stopped to pick up milk or something on the way home he would have an up to date list of what else we needed (wine for example). As the app became more developed they added an area for recipes which allows you to input your own favorites or automatically pull them from your favorite websites into storage. The recipes then have an area to add them directly to your shopping list and now into a meal plan calendar! You can plan your entire week from your recipes and then add the whole week to your shopping list in a couple of clicks. The list automatically syncs between phones so whether I'm shopping, or Ed, or both of us but in separate parts of the store (shopping with a baby am I right? #divideandconquer ) we are instantly up to date. I've got a lot of recipes stored and folders for go-to-faves when I don't have time to think about it. Importing from Skinnytaste or CookingLight is super easy too. VOILA! YOUR LIST IS DONE! And just like that the week is planned and the list is on all devices, you can pretty much nap and send dad to the store. While the app itself is free, all of these features have a small fee of $11.99 per year in order to completely synced as a family and across the web app, desktop and phone. We have found it to be a no-brainer and have reknewed every year. Good news for Gliss Nest readers, we are giving away one premium subscription to AnyList Complete to a lucky reader! In addition to winning I'll send you my top 10 favorite recipes from my favorites folder and you can be on your way to eating healthy, quick meals in no time! Good friends don’t have to be told often…. “Thank You”…. but I’m going to say it anyways. Thank you. For what you ask? For so much you’ve done that you probably didn’t even realize. Thank you for sticking with me in this crazy season of life. I know you texted me 27 hours ago and I haven’t written back because, I know, you are the last person who would get mad at me in a long list of other things to do. Thank you for understanding that my whole schedule revolves around mid-afternoon nap times and 7pm bedtimes. For not taking it personally that I say ‘no’ more than ‘yes’ when making plans. Thanks for putting up with me not 100% listening when we are together because I’m keeping an eye on my daughter who will occasionally often try to eat cat food or throw out the TV remote. Thanks for not reminding me I’ve told this story already. Thanks for laughing at my mom brain when I put milk away in the pantry or forget my debit card, again. For checking in on me when I’ve gone iPhone silent for days. It’s so encouraging to know that even though we may go days, weeks, months without seeing eachother that there’s no grudge and we’ll pick up right where we left off. For those of you who don’t have kids, thanks for not making me feel like a lame mom and loving on my kid so much. For those of you with kids, your advice may go without feedback sometimes, but I’m listening and using it all the time. Thanks for understanding that even though our kids seem close in age that even just a few months different makes planning things together hard. I seriously treasure every single friend through this journey and my absence doesn’t need justification but it means the world to me that you know I’m here whenever you need me. Some of these days are long, but the years are short. It will be no time before we are back to wine tours or evening events while our kids are off being too cool for us. Until then, thanks for not giving up on me! "It's my last day of maternity leave. It makes me tear up just to say the sentence out loud. There are a lot of feelings that come along with today… Guilt, that I won't be able to spend enough hours with my daughter outside of work hours. That I will spend 40 hours at a place that I don't love, and come home and spend time here two hours every night with Avery most of which will consist of feeding her and getting her ready for bed. Anxious, that things have changed at my job or things weren't done correctly and I'll be bringing stress home to my house that has been filled with excitement over new sounds, rolling over, long stretches of sleep at night, my hair unwashed for three days, wearing my pajamas all day, laying on the floor and reading books and watching Avery take in the world. Regret, that we didn't go outside enough, that her baby book remains untouched, that I haven't written my birth story, that I didn't get enough pictures, that we didn't make enough noise during naptime to get her ready for daycare, and I spent so many hours reading the Internet and not just listening to what my baby needed, that we didn't take enough walks, breathe in the fresh air, get in those naptime workouts. Fear, that I won't be able to keep up, that dinner won't be eaten together every night and won't be healthy, that laundry will pile up, the house Will look dirty, the new car will be a mess, that I'll be more tired than I have been and spend less time with my husband, maybe listen a little less, and spend too much time complaining about work in the little time we have together every day. Guilt, anxious, fear, regret, they are all words that have no positives and all I can do today is try to find the positive in tomorrow. I'm going to take every single minute for today with Avery… Because nothing I do today is going to change that I have to go tomorrow. So where is the good in all of this… The mechanical answer would be I must work so that we can continue to dig out of debt and be able to save for things like the home we want to bring up our children in, vacations to show them the world, hobbies and things that make her happy. (And her daddy) But other things are good too, we are sending her to a wonderful daycare facility that will teach her things and socialize her with other children. She will learn from being around them how to use her voice, crawl, enjoy story time and music. My job is flexible enough to where I can control how much time I can spend with her, if only I could control getting up early in the morning… Which I'm not very good at. My goal would be that at least once a week I do an early shift so I can get out and take her somewhere fun, like a park or a stroll downtown, or just home for some good old Mommy playtime. In a few weeks it will feel normal, I'll see all of the other people at work who have to go through the same thing every day, before I know it months will have gone by, then years and we will be a family with two working parents and it will be the new norm. What we have to commit to as a family is putting each other first, taking vacations even when they're staying home, and even cherishing those late nights waking up in the middle the night and the sweet cuddles and rocking to put her back to sleep. The first few weeks when Ed was home will be some of my favorite memories of my life. When all you can do is laugh because you really have no idea what you're doing but you're doing it together. We laughed so hard we cried some days and some days like the day before he went to work we just cried. I will never forget how making a new noise made us stop in our tracks and run over to cheer her on and see her smile. And I'll never forget how she stretches out with both arms over the top of her head when you wake her up in the morning and she just smiles up at you. And sometimes after the 3 AM feedings she would be fast asleep until you put her down in her crib and then her eyes would just pop open and she would give you a big smile waiting to play. We both spent plenty of evenings and early early mornings with her nustled up in our arms wanting to be close and warm and falling asleep in the recliner. And Ed sleeping on the floor for the first three nights underneath her bassinet to make sure that she was OK while I got some shut eye. And introducing her to her grandparents and looking at their eyes well up with happiness. So what do you do when there's nothing I can do to delay tomorrow another day.... snuggle a little longer, break all the rules, let her sleep on me, rock her a little longer, play more. So here we go. Bags are packed. Mommys going back to work. May you look up to me one day for being strong for you. And smile when I get home tomorrow." ...the past year really has flown by as cliche as it sounds and I still have a lot of the feelings I had on that day a year ago. I'm proud of myself that I have exceeded my goal of waking up early once per week and normally do this daily now, getting out of the house before 7 most mornings and leaving work before 5 to maximize our time. As a family, we keep each other in check to spend one on one time together before bedtime to really connect and I think Avery really loves this time together. I went down to working part-time to keep up with things in our lives and while our time together in these young years will never be enough, I couldn't be happier and I'll always constantly fight the guilt that can make its way into trying to ruin our happy. And thankfully, she does LOVE daycare, especially music class and she kicks and giggles when we pull in everyday but still runs over to me laughing when I pick her up each night. Last Friday I woke up super early and got a few hours of work in and left my office at 3pm to go and get Avery for a special Mama & Daughter 5 minute session with Sabrina Fields among some pretty awesome fall colors. It was probably more special to me than her at this age but I can't get enough photos of me being present in her life, especially in the out of routine and spontaneous moments like these. 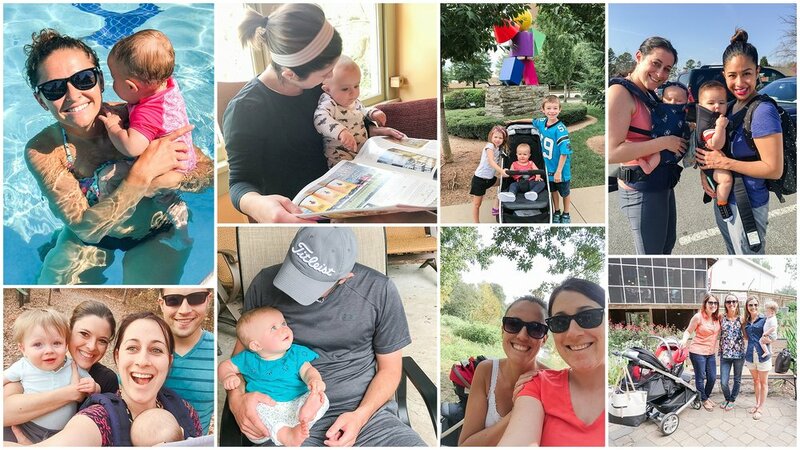 To any other working moms or moms who work as moms, don't let the guilt get you, keep your goals realistic and reflect back on these times often! You're doing awesome! Sign up for our monthly-is newsletter with your email address to receive news and updates. They grow up so fast. Like for real. But one thing I looked forward to since I was pregnant was doing monthly updates of Avery. We bought a cute baby book and had rich intentions of filling it out every month but really these Instagram posts were the only thing we really stuck to but I'm so glad we did. I took a different approach than some by using a different blanket, towel, or sheets to capture the month, I wanted to have a variety of photos after 12 months without being too "prop" filled. I love how the 12 month came out and ironically as Averys personality got more colorful so did our photos. 1. Decide on your vision in the first month. Whether it's the same background and a sign or graphic or a variety. 2. Consider adding something for proportion. If you'd like to show how much bigger your little one actually grew you can consider incorporating a stuffed animal or printed blanket. 3. Recruit help as they get older. In the spoofs below you'll see Ed was often my photo assistant and expert smiling baby pro. As they get more mobile it's alllll about distraction. And it makes for some good bloopers. 4. Use an app that matches your style to make graphics. I used the app Studio+ for the color matched circles and LittleNuggetCo had the best graphics that matched my more modern and chic style for graphics. Their premium pack is just a few dollars but so worth it for all things milestones even as they are older kids!! Now for the bloopers !! The outtakes are just too funny for me to delete. Check out some more tips and see how we were featured on the Little Nugget Co blog!